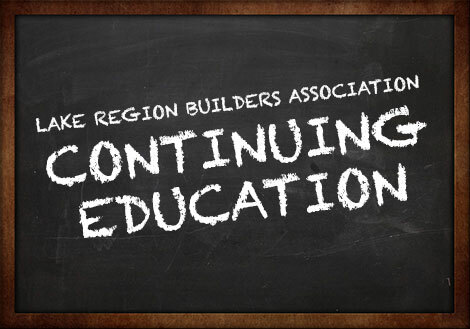 The Lake Region Builders Association offers several continuing education classes each year. These classes are designed to help trade professionals stay current with the ever-changing industry, while earning valuable continuing education credits. The classes are offered to both members and non-members. Members receive a discount, which is another great reason to join our association! Contact Vicki at 218.847.0699 for additional details. In order to manage the size of the class, it will be offered on 2 days. ONLINE: Registration for this class is directly with Midwestern Electrical Seminars. Clicking the links provided will redirect you to the MWES website - www.electricalclass.com -- for online registration. For questions, please contact Vicki at LRBA (218) 847-0699. An administrative overview of when/ where the State Building Code applies. Another is Building Planning, a critical part due to its nature of setting the many parameters for residential projects. Additionally, exiting, window fall protection, stairs, emergency escape and rescue are included with the various topics. As new building materials and methods emerge constantly, we must understand the process of approving Alternate Means and Methods. Participants will learn how to verify materials that meet the intent, but are not specifically addressed, by the State Building Code and the process to gain approval of local Building Departments. This class includes 6 hours of code review as well as 2 hours of technical as required by the state of Minnesota. The class is open to both journeymen and master plumbers. The day includes 3 sections: IS for PVC, which covers the installation standards regarding PVC; Combination Systems, which covers regulations regarding combination waste and vent systems; and Storm Drains - DWV, which covers sizing roof drain systems as well as some review of DWV standards and regulations. Registration for this class is directly with the instructor at MyPlumbingTraining.com.